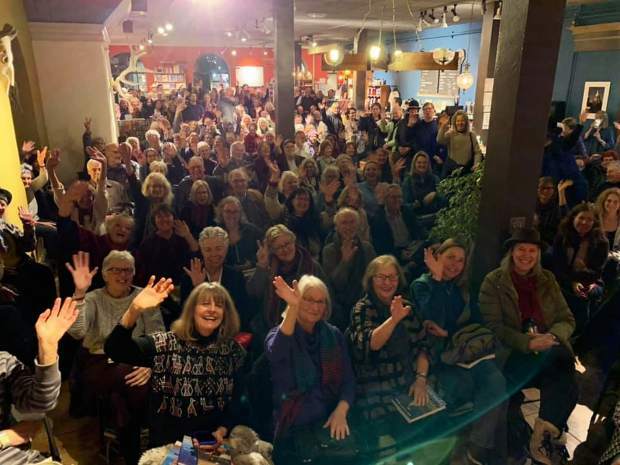 Author Pam Houston spoke to a packed event in Santa Fe, New Mexico at one of the stops on her "Deep Creek" book tour. How do you love this broken world? It’s a central question to author Pam Houston’s new book “Deep Creek” and one that she will discuss in an event this Friday at the Headwaters Center. Houston will be interviewed by fellow author Samantha Dunn in a sold out event at the Headwaters Center in Winter Park at 6 p.m. March 1. It is hosted by the Grand County Community of Writers and the Grand County Public Library District and sponsored by the Grand Foundation. “Deep Creek” is a memoir of Houston’s 26 years on her ranch in Creede and her experiences as the steward of the property, as well as a reflection on how her relationship with the land shaped her. Martin Smith, an event organizer for the Grand County Community of Writers, said Houston’s book and the conversation on Friday will be particularly relevant to Grand County because of her strong voice and emphasis on the environment. Dunn, who will be interviewing Houston on Friday, said her plans for the conversation are to really showcase Houston and give the audience an intimate look at the book. Dunn and Houston have been friends and coworkers for seven years, so Dunn said she believes the conversation will reflect that comfortability. Ultimately, Dunn said she hopes the audience is inspired to read “Deep Creek” and that they find inspiration for their own work. However, she also hopes that both the book and the conversation cause people to reflect. “I really hope that everybody kind of takes a moment of pause to say how do we love this, as Pam would say, this broken world,” she said. Houston agreed that one of the goals of the book is to encourage readers to recognize the relationship we have with the environment and the damage that’s been done. She said she has been pleasantly surprised by the reaction to the book so far. “I would have never imagined that me speaking plainly about the things that happened to me and speaking plainly about the land I love would be so moving to people,” she said. This understanding echos one of the broader goals of the Grand County Community of Writers, which is to show that good stories can be found anywhere. “You don’t have to travel the world to get your arms around great stories, they’re right here all around you,” Smith said. For Houston, she’s also looking forward to her homecoming to Grand County. She and Dunn will be giving craft talks on March 2 at the Ouray Ranch Lodge for members of the Grand County Community of Writers. Finally, Houston will be interviewed at the local radio station KFFR. Houston has also written “Cowboys are My Weakness,” a short story collection, as well as two novels, other short stories and a collection of essays.